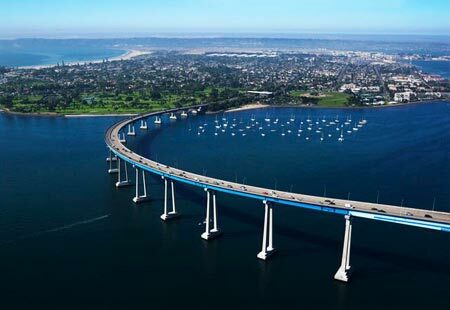 When you cross the bridge over to Coronado California, you are transported onto an island oasis. The island itself looks like a resort destination. It is so quaint and alluring with the different architectural styles of the homes, the beaches, the shops and eateries, and of course the very famous Hotel del Coronado. I highly recommend spending some time exploring this beautiful paradise if you are ever in the San Diego area. The beaches are very nice and clean with beautiful views. Mostly everything is within walking distance or you can rent a bike or segway to explore. The best way to find a place to stay in the area you're looking for is to compare these two travel sites. They both comb through 100s of booking sites across the net to find the best deals possible. Click on each link, enter your desired destination and traveling dates. Also, its so important to read the reviews for each hotel you are interested in. Just because the picture might look nice, doesn't mean it is! Or click on these links to go directly to the hotel page. Here are just a few. Coronado Central Beach - has lifeguards on duty and showers and restroom facilities. This beach runs along Ocean Blvd. with a backdrop of mansions and fine homes. There is fishing in front of the Hotel del Coronado with tidepools and fire rings. Coronado Dog Beach - is located at the most northern end of Central Beach next to the Naval Air Station. This is a nice getaway, its wide and sandy with the Hotel del Coronado in the background. Glorietta Bay Beach - This spot gives you a great view of the San Diego-Coronado Bridge and the Glorietta Bay. Enjoy hours of fun with a large grass-filled park, a small beach, a playground and restrooms. Its located south of the Hotel del Coronado. Silver Strand State Beach -Picnicking, volleyball,water-skiing,boating, surfing, swimming and camping are popular activities here. A lot of people who camp here are repeat customers. Tent camping is not allowed but there are 136 spaces for RVs. Ferry Landing Marketplace - has restrooms and free parking. Its a sandy beach adjacent to the fishing / ferry pier. It also has a grassy lawn area with awesome views of the San Diego Bay.